Photo from Centre County Gazette Interest in World Cup soccer matches has given area businesses a boost. The U.S. soccer team's exciting World Cup run came to an end on Tuesday afternoon with a 2-1 loss to Belgium. And, despite our national team being out of the tournament now, the World Cup hopefully will have a continued positive effect on area restaurants and businesses. "It's impacted us greatly," says manager Dan Stokes of Kildare's Irish Pub on East College Avenue. Business can be slow this time of year, especially since students are on summer break, he said, but the World Cup has "definitely helped financially." The restaurant might be having an average day, Stokes said, but will end up doing very well financially because of the matches bringing customers in. For the U.S. team's game last week against Germany, there was a line of people waiting to get inside at 10 a.m.
Kildare's has daily drink and food specials, which Stokes said helps bring customers in. The Irish pub also broadcasts every game with the volume up so viewers can hear every call and goal. "It makes it more exciting," he says. Michael James, manager of Bill Pickle's Tap Room on South Allen Street, says the restaurant and bar already had quite a following of soccer fans going into this year's World Cup. "This is our third World Cup broadcast since June 2005," he says. This is the first time since then, however, that the United States has been in the same time zone as the tournament host, which makes showing the games easier. As the tournament has progressed, James says that it has only gotten more intense, especially now that it's into the knockout rounds. "It will only get better," he says. 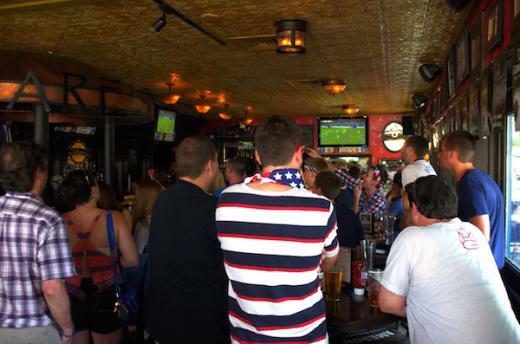 Games besides those that the U.S. team participated in have also been well attended at Pickle's. "We get great turnouts," James says. At Damon's Grill, located on East College Avenue, owner Scott Reimer says that World Cup reception has been "awesome," with sales up 200 percent more than usual. "We've had a packed house all three (U.S.) games. That's about 500 people," he says. While the U.S. team's games have been the most popular, Reimer notes that he has seen a variety of national jerseys there. "It's a sport that 20 years ago was not as popular. Now there's much more involvement," he says. The World Cup has also brought in customers to local sports stores, like Rapid Transit Sports. "We do get some people coming in and asking for certain things," says manager Terry Stark. The specialty sports store has been discounting World Cup T-shirts and hats during the tournament. Brittany is the staff writer for The Centre County Gazette. 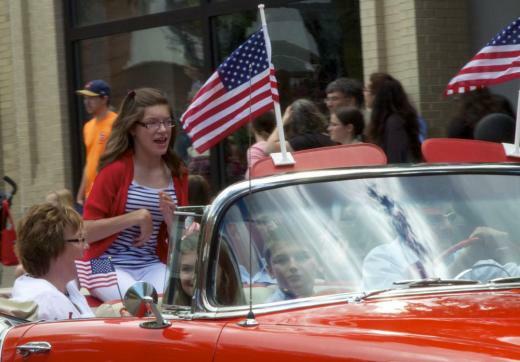 Shirley Karduck looked out from a sleek, silver sports car at crowds of people gathered along College Avenue for the third annual 4th Fest Parade of Heroes. Behind her, crews pulled along huge red, white and blue balloon animals and the sound of horse hooves echoed off the blacktop.